It may look innocuous on the map, but the capital Gulf of Corryvreckan – the 1km wide channel between the Northern end of Jura and the Island of Scarba – is home to one of the 3 most notorious tidal whirlpools in the world (the others are the Maelstrom in Norway’s Lofoten Island’s, and the Old Sow in Canada’s New Brunswick). The tide doesn’t just rise and fall twice a day, it flows – dragged around the earth by the gravitational attraction of the moon. On the West coast of Scotland the rising tide – known as the flood tide – flows northwards. As the flood moves up the Sound of Jura, to the East of the island, it is forced into a narrowing bottleneck jammed with islands and builds up to a greater height than the open sea to the west of Jura. As a result, millions of gallons of sea water pour westwards through the Gulf of Corryvreckan at speeds of up to 8 knots – an average sailing yacht is going fast at 6 knots. 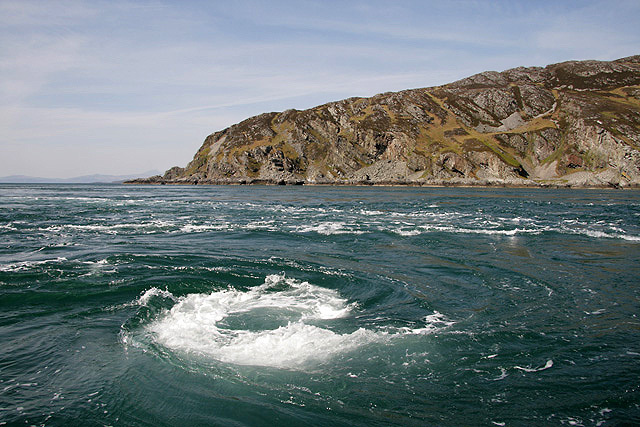 The Corryvreckan whirlpool forms where this mass of moving water hits an underwater pinnacle, which rises from the 200m deep sea bed to within just 28m of the surface, and swirls over and around it. The turbulent waters create a magnificent spectacle with white-caped breakers, standing waves, bulging boils and overfalls, and countless miniature maelstroms whirling around the mail vortex. Corryvreckan is at its most violent when a flooding spring tide, flowing west through the Gulf, meets a westerly gale blowing in from the Atlantic. In these conditions, standing waves up to 5m high can form and dangerously rough seas extend more than 3 miles west of Corryvreckan, a phenomenon known as the Great Race. Corryvreckan is a real hidden gem and is worth a visit on your Scotland tours.